Honiton’s Friends of the Beehive charity supporting the building of our new Beehive Community Centre is one of the 43 finalists chosen by the Express & Echo newspaper to win a share of £25,000 !!! We are guaranteed £450 but in order to get a larger share our community needs to pull together and collect coupons from the newspaper each week before 21st March. Can you help us? 1. Fill in the coupon collection form “I wish to vote for FRIENDS OF THE BEEHIVE, HONITON” and cut out the little coupon (it’s about the size of two postage stamps) then post it direct to the paper to arrive before Tuesday 26th March. Address details on the form. 2. 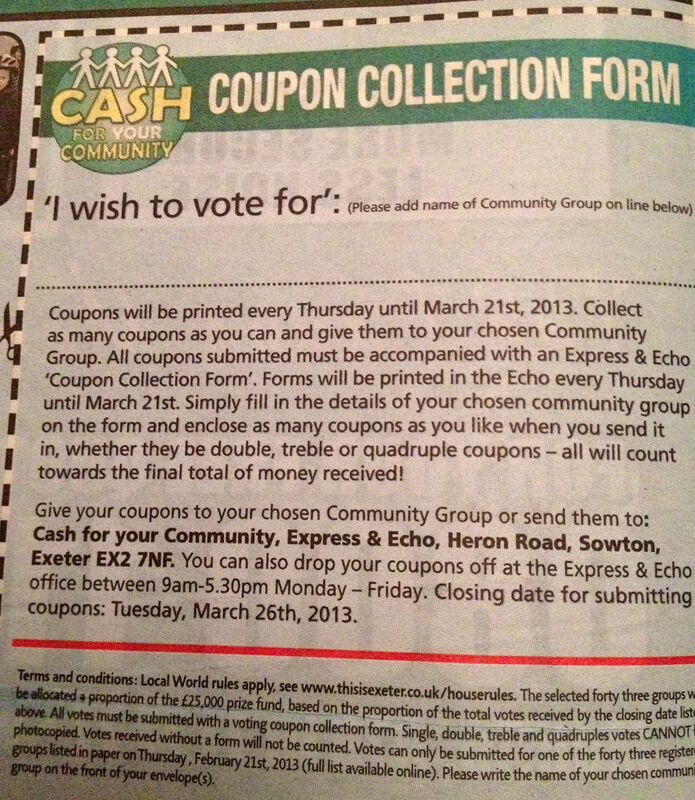 Or collect the coupons and hand them into us by the end of Thursday 21st March so we can post them all off together. Drop the coupons off in an envelope to ‘Sharon Pavey’ at the Town Council Office on New st. This is the blue door opposite The Wool Stack knitting shop. Don’t forget to cut out the little coupon (see below) too – it’s easy to miss. 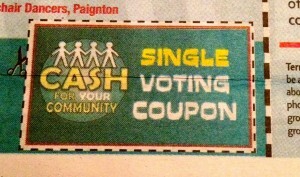 It says SINGLE VOTING COUPON on it. Thanks everyone – please pass this on to everyone you know in East Devon and Exeter so we can collect as many coupons as possible. Add a comment on here if you can help so we have an idea of how many coupons are coming in. Thanks ever so much. Next PostNext Shout from the Rooftops!